1. Product build-up is the fastest way to dull-looking hair, so make sure you wash your hair thoroughly every other day. If you have a lot of product in your hair, wash it twice if necessary. At the end of every hair wash, blast hair with cold water to seal the hair cuticle shut for added shine. 2. After washing your hair don’t skip the conditioner, as this will help to keep hair strong and nourished, so make this part of your haircare routine. 3. Once a week, treat your hair to a deep conditioning treatment. Maximise your treatment by applying it to your hair before getting in the bath, as the heat from the bath will encourage the hair cuticles to open and therefore allow the conditioner to penetrate deeper into the hair shaft. 4. After washing your hair don’t rub it dry; pat hair with a towel in one direction down the length of your hair shaft, to encourage the cuticles to lay flat. This helps hair to reflect the light and encourage shine. 5. 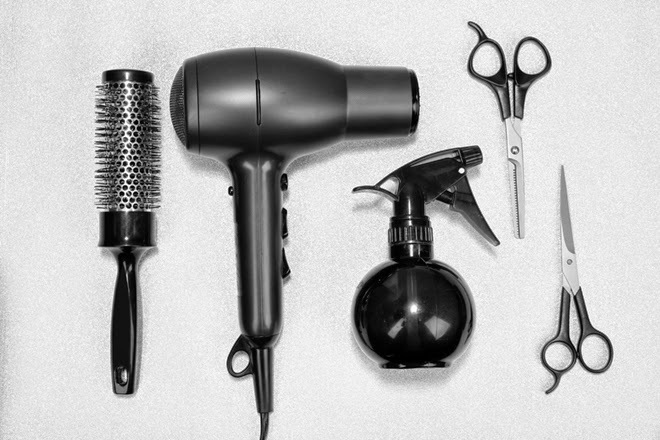 Heat damages hair so keep hair drying and heat styling to a minimum. When you do use heat on your hair, turn down the temperature on your hair dryer and point the nozzle down the hair shaft to smooth down hair cuticles. Don’t blow dry hair when it is soaking wet as this will only increase the amount of time your hair is subjected to heat. 6. Hair oils have been big in beauty of late and for good reason – gone are the heavy oils that make hair look lank and greasy and in their place are a raft of nourishing treatment oils that infuse hair with vitality and shine and help smooth down the hair cuticle. 7. Some hair products are dedicated to making your hair look shiny – serums or shine sprays are both good options for added sheen. 8. For hair that shines with health every day, you have to feed it from the inside out and this means drinking plenty of water and eating a healthy diet that is rich in vitamins, minerals and essential fatty acids. Try adding Udo’s Choice Ultimate Oil Blend to your daily diet to provide your body with the optimum balance of essential fatty acids with ease. It would be so nice to have some single magic product, which would give you perfect hair once and for all. Unfortunately, our beauty requires hard work every day. Hair care does not only limit with a nice shampoo and mask. Our body should receive enough nutrients. That is why I diversified my ration and started taking special vitamins for hair. This is a supplement – Hair Gain Formula, developed by nutritional scientists. It contains herbal compounds and vitamins to support healthy hair growth. It also helps to fight hair loss and makes hair healthy and thick. I like this product because it is natural and gives my hair everything it needs.